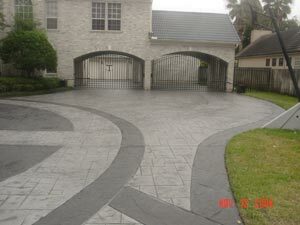 What happens if you already have a concrete surface, and you want a decorative stamped concrete surface? If your concrete surface has already been poured, but you would like it to improve its look with stamped concrete, not to worry, Impressions in Concrete can help. The answer is concrete overlays. Concrete overlays can turn a heavily worn out surface into a new-looking one. Under the skilled hands of Impressions in Concrete’s experts, a concrete overlay can actually provide the beauty and versatility of decorative stamped concrete at a fraction of the removal and replacement cost. Dressing up your existing concrete flooring surface has never been easier with a stamped concrete overlay. If your concrete surface is stained, or not the most appealing to look at, stamped concrete overlays can restore your concrete to a new, revived beautiful look and feel. A thin polymer concrete layer is applied to your existing surface and then stamped over your existing concrete and sealed for protection. There are many patterns and a variety of colors to choose from and can be applied on patios, driveways, walkways, pool decks and also on interior flooring as well. 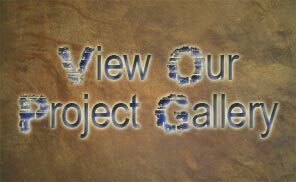 Designs can be made to resemble polished marble, flagstone, clay brick, cobble stone, wood flooring the possibilities are endless. Concrete Overlays – Go Vertical! Have concrete walls that show cracks or just look unsightly? Concrete overlays can be installed not only horizontally on floors, but VERTICALLY on walls! Restore those ugly concrete walls with a concrete overlay and turn that grey, dull concrete wall into wood planks, polished marble, flagstone or a custom design. Add a stain to your concrete overlay to bring out a whole new dimension in decorative stamped concrete. 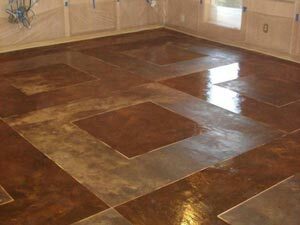 Stamped concrete is one of the best ways to improve concrete indoor and outdoor flooring. Whether you are pouring a new floor surface, or if your floor already exists, we can beautify your home or business with an elegant, easily maintained, and energy saving stamped concrete floor design that is customized to your desires. 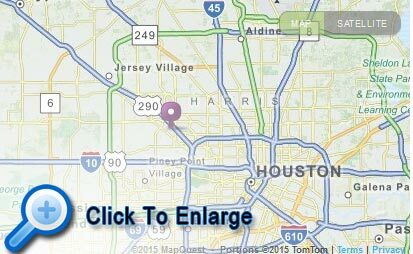 Fill out the information below, and one of our stamped concrete design experts will be in contact with you, or call us at 713-682-8337 for assistance.